Here are some brief notes on some events, postures, and products that might interest you. December 5 - Join Marnie Bacon and a merry band of musicians at Dragonfly Yoga Studio in Marshfield, 7-9pm, for this informal practice. We will immerse ourselves in the healing powers of sound and song. Perfect for combatting holiday stress! New this fall -- check out the beautiful sounds of Marnie's Indian Harmonium! The Trauma Center at Justice Resource Institute has received a National Institutes of Health grant to study the efficacy of yoga for women with treatment-resistant Post Traumatic Stress Disorder. They are offering free yoga classes in Brookline, MA on Thursdays from 6-7 PM. You will be paid $200 for a 10-week session (that's right, they pay YOU), and you will be able to stay on all of your current medications. Candidate should be an adult woman survivor of childhood trauma, between the ages of 18 and 58, with a three+ year history of psychotherapy. For more information, call Dr. Ritu Sharma at 617-232-1303 x 208, or email her at rsharma@jri.org. KEZIA'S YOGA CD MAKES A GREAT GIFT! Check out Kezia's new instructional CD, Gentle Yoga. This approx. one-hour audio recording features all the elements students enjoy in Kezia's typical yoga classes – centering, warm-ups, a gentle flow of sitting, standing, supine and table-position postures, and of course, rest pose. The cost is $15.75 (including tax) -- you can get it directly from Kezia. Add $2.50 if you want it shipped to you. Payment methods: cash, check or Paypal. Buy it for yourself for those times when you can't make it to class -- or give it as a gift! The lion pose, or simhasana, is a great way to bring circulation to your throat and glands, which helps to expel germs and fight colds. It's also really fun to d o -- especially in the company of children or grandchildren. 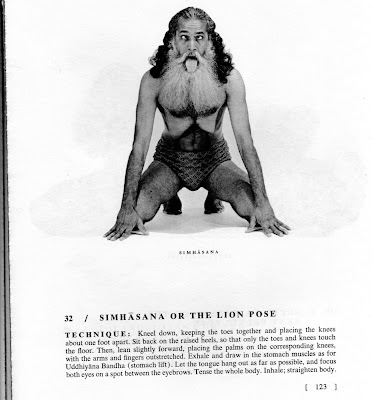 Here's a photo and instructions, from Sri Swami Satchidananda's "Integral Yoga Hatha" book. If anything it will make you laugh, which is also good for the immune system! Remember, yoga is the perfect antidote to holiday stress. I hope to see you in class soon. Look for my teaching schedule at www.hellokezia.com.